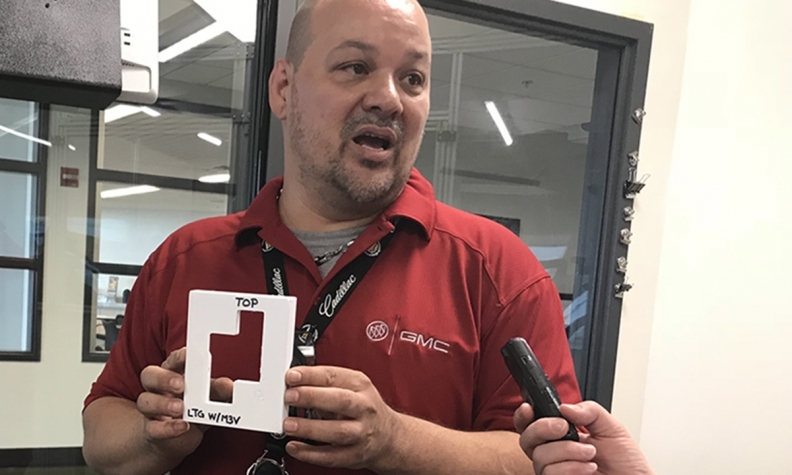 Zane Meike, additive manufacturing lead at GM's Lansing Delta Township assembly plant, holds up a common 3D printed tool used to align engine and transmission vehicle identification numbers that cost US$3,000 to buy from a third party. That same piece costs less than US$3 to be 3D printed at the plant. LANSING, Mich. -- General Motors is increasing the use of 3D printing at its plants, including those in Canada, to streamline operations, which has the potential to save millions of dollars in annual production costs. Dan Grieshaber, GM's director of global manufacturing integration, said most of GM's factories have 3D printers. Use of the technology has recently increased, leading GM to expand and better standardize operations. "We're quickly evolving, creating real value for the plant," he said June 19 during a tour of GM's Lansing Delta Township assembly plant in mid-Michigan. "This will become, as we progress, our footprint. We'll have this in every one of our sites." 3D printing is already being used at GM’s Canadian manufacturing facilities, spokeswoman Jennifer Wright confirmed in an email to Automotive News Canada. 3D printing is being embraced by industries across North America to produce rapid prototype parts for design and manufacturing. GM is using it to quickly build tools and accessories for workers at the plant. A roughly $35,000 (all figures in USD) 3D printing machine, including housing, at GM's Lansing Delta Township plant has saved the company more than $300,000 over two years on tools and other accessories, according to Zane Meike, who leads the plant's 3D printing efforts. While a few thousand dollars isn't much to GM, such savings across several tools and its global manufacturing footprint can quickly add up. For example, one common 3D printed tool used to align engine and transmission vehicle identification numbers cost $3,000 to buy from a third party. That same piece cost less than $3 to be 3D printed at the plant. "You can't do this in some remote central location and get the synergies of the everyday problem-solving," Grieshaber said. The Lansing Delta Township plant, which produces the Chevrolet Traverse and Buick Enclave, originally bought the machine to create kitting boxes for parts. But other uses -- many suggested by plant workers -- continue to be adopted to improve safety and for cost savings. Meike said the 3D printer has a couple dozen uses in the 3.6 million-square-foot plant, including making socket covers, hangers for parts and other ergonomic and safety tools. GM, according to Grieshaber, is working to standardize 3D printing and share best practices across all of the company's plants globally. The 3D printing is part of what GM calls "Manufacturing 4.0," or "smart manufacturing." Both are all-encompassing terms for new manufacturing processes and tools being implemented. Other processes and tools highlighted Tuesday at Lansing Delta Township included the use of drones for interior inspections and "collaborative robots" that can safely operate around and with human workers without the use of safety cages. Marty Linn, a GM robotics engineer, said the automaker has more than 50 uses for such robotics, including stacking tires and calibrating a vehicle's headlights and long-range radar. Grieshaber said GM also plans to continue to expand the use of such collaborative robots. "Integrating new technology with existing technology is really important," he said, adding that also includes implementing systems and processes to assist human workers. GM also is using big data and other sensing capabilities in plants to detect potential problems before they occur. Such proactive measures could eventually lead to the machines having the capabilities to mend themselves, a form of artificial intelligence. Grieshaber declined to put a time frame on such capabilities.